You must be knowing about blackholes but let us know something about Whiteholes. 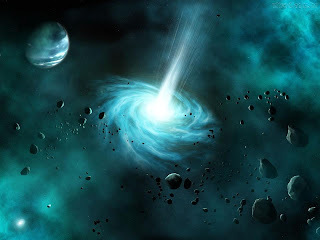 A white hole , in general relativity, is a hypothetical region of spacetime which cannot be entered from the outside, but from which matter and light have the ability to escape. In this sense it is the reverse of a blackhole , which can be entered from the outside, but from which nothing, including light, has the ability to escape. Like black holes, white holes have properties like mass , charge , and angular momentum . They attract matter like any other mass,but objects falling towards a white hole would never actually reach the white hole's event horizon the white hole event horizon in the past becomes a black hole event horizon in the future, so any object falling towards it will eventually reach the black hole horizon..